shine brite zamorano: the idea man. 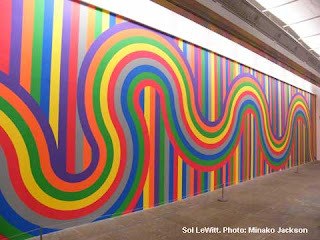 I was inspired by the projects done over at color and collage that focused on the work of artist Sol Lewitt. Sol was a prolific artist who came up with some amazing wall drawings that had beautiful interactions between the elements of shape, line, and color. Most of his mature work was done on walls. He always considered them drawings even when the materials shifted to acrylic paint. He fit nicely with the artists the 5th graders had been introduced to in this last rotation because even though he was not considered a graffiti artist, his work has the same presentation- large scale abstraction on a wall. One of the interesting things that makes his work different than Remed and Supermundane is that he did not draw his images on the walls. Other people did. Being a Conceptual artist, he was more focused on the idea. That was the most interesting and important aspect of the creative act for him. He made plans and diagrams, but the large scale work was carried out by assistants, students, and/or art novices. The students thought this fact was quite interesting and I got numerous monetary offers to create the visual products of their ideas. After being told that they were responsible for the actual drawing and their disappointment over this fact had dissipated, we got rolling with the project. Students got 3 6x6" squares and needed to draw a line on each that started on one side and finished on another. What the line looked like between those to points was up to them. This first line on each sheet needed to be the same color. After that, as they added more and more lines to each sheet, the color choices were also up to them. Once the sheets were complete, students taped them together so that the first line on each connected with one another. After this, students made cuts along the edges of the squares that followed the contours of their lines, to make the completed shape a bit more funky and interesting. The final step was to hook up with another student or students and create a watercolor background that the pieces would get glued down to. This also used repetition in line and shape. Your students did a wonderful job interpreting the work of Sol Lewitt. I love the variety of lines. Kinda funky, D. Did the students like Lewitts work? Was this watercolor or tempera? And, just to be annoying(LOL),did you limit their color palette on the 3 6x6's? They did like it. They thought the time lapse videos on the MassMOCA site were way cool. Watercolor in the background, crayon on the 6x6s. No limit on the palette, except for the very first color they chose.